forthcoming book: Soldiers of Fortune. jt: When did you first come up with the idea for this book. I know that it's been several years since your first contact with me for information/assistance on the project, so this is obviously not just a quick "knock off". Alan: Well, the project began in the early part of 1999, perhaps Feb. But, interviews etc didn't begin until the following Nov. And to the best of my recollection that was the only interview to take place that year. It was with a guy called Marcus Connaughton who works with RTE Cork. He was at a given time 'Label Manager' with Polygram. jt: Did you start out with the idea of a biography? Alan: The initial idea was to gather a 'Collection Of Recollections' as opposed to concentrating on a full in depth bio. The reasons for this was mainly marketability. Plus I had read a book on Freddie Mercury called 'This Is The Real Life' which was a combination of memories from people who knew the man. I wanted to do this with Phil, nothing original, but it did seem like a good idea considering that it may have brought out the more positive aspects of his character. This was initially accepted by the first publisher but because progress was slow, after about six months they bailed. If I had continued along this line the book could have been wrapped up within 12 months. So I concentrated on getting as many interviewees together as possible, especially those on the fringe of both Lizzy and Lynott solo, the likes of Jerome Rimson, Gus Isadore, Mark Nauseef, Graham Parker, Radiators From Space, Robin George, Steve Johnson, Dave Flett, Chris Tsangarides, John Alcock, Tony Visconti, Kit Woolven, Paul Hardcastle, members of the Lynott family, his two aunts, Betty and Marian etc. This was entirely self-financed, so there had to be light at the end of the tunnel or so I believed. It took time, but what doesn't. I ended up speaking with people who had worked with and were employed by people I really admire, that in itself was payment enough for me. When it is released it will have spanned 5 different years, but hey that's the way it works sometimes. After reading it myself over and over, I would change an amount, I just hope the detail I strove towards is maintained through the editing process. jt: I understand that you touch on the "unreleased" material that many feel is hiding in vaults or private collections "somewhere". Alan: There is a lot of mystery surrounding Phil Lynott's solo work and this is revealed to a degree, some people just don't want to comment on such stuff so I have reached my own conclusion. 'The Man and his music series' put paid to a decent box set, and I do believe there is a very limited amount of new/unheard material somewhere. However, I do believe there to be an avalanche of alternative mixes. For if 'Revolution' can exist with a Lynott vocal, anything is possible. The 1978/79 period was quite fruitful for Lynott and with the array of musical connections he made it would be well worth investigating further, perhaps someone else may delve into it for another bio, it wouldn't surprise me. jt: There are already some books about Philip and Thin Lizzy out there. What will make this one different? Alan: All in all, I am happy with it, I hope that people will take it for what it is, simply an information block, and they may do with it what they please. They can believe it or not. I'm almost in a role of narration for this book in that the people who were there at the time tell the story the way they lived it. I couldn't see any reason not to write it like that for it would probably prove to be my own undoing if I did. The people who were there carry the story, I direct it to a degree, if you know what I mean. Though believe me sometimes the direction wasn't very appreciated, people will try to get their own way in an interview so I thought it important to concentrate on the musical aspects before intruding on what is in essence private grief at the loss of Lynott. It's a dodgy area, and says a lot about the effect that he had on people. They miss him so much, some people were crying at given points in the interviews. jt: So tell us please, "Who is" Alan Byrne? The way I've worked on this project has been I suppose quite cliched. I took the bar jobs, retail store jobs, Insurance, anything really that could pay my rent, get me a ticket to Dublin, get me home, listen to the tapes and see what I could use. I studied media and presently I'm freelancing. This project has been written more or less in my hobbie time, that's another reason it has taken so long, it has very much so been done on a part-time basis. Personally speaking there was only so long u could put in 18-20 hr days before u need to take time out. The year 2000 (all of it) was worked like that, but I'm not moaning about it, that's just the way it had to be done. Christ, I was mad. jt: When did you become interested in Philip and his music? Do you have a favourite period or band, i.e. Lizzy, Grand Slam, solo Phil etc.? 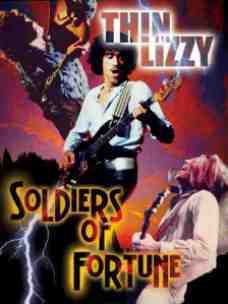 Alan: I first heard of Lizzy through the 'Black Rose' album, probably the last good one they had really. My parents would be largely responsible for my appreciation of rock and roll. Grand Slam remain in my eyes largely under-rated, but it seems few will put the money in to try and get an official release for them or even fashion the songs into a tribute album for Phil. jt: Am I correct in sensing that this is not "just a book" but a more like a "labour of love"? Alan: Labour Of Love. A lot of people say that to me, but truthfully at the end of the day, it was a job. I would preferred to have done it in 10 years time but nobody lives forever so I took the decision to start when I did. When I started this project I was 22, I turned 26 last weekend. So it could really have fallen flat on it's face, but somehow I fooled them all (joke). 'The Rocker' seems to be everyone's fav', I wanted to take that a step further. All of the books contribute or say something, be it good or bad so I really think it's best to read as many as possible. That's why I also hope that there are other people out there who might consider researching the Lynott/Lizzy career. There is the room in the market now, so hopefully things will snowball, especially with the movie coming out. I've taken care of a few loose ends with the book, gone into detail about the lost material, re-interviewed many about the Phil Lynott they worked with and socialised with. The quotes I have contaradict many things that have gone to print before. So basically I hope that this book will fill a few gaps that were previously unattended. Special thanks to Alan for sharing his time and thoughts with me and for allowing me to share them with you.